"I'm making these recordings for the amusement of those who rent this ship in the future." I totally want to see this. A trailer has debuted online for one of the latest Sion Sono films, titled The Whispering Star. It already played at the Toronto Film Festival last fall, and Rome Film Festival, but has no release date yet. The film is about a female android that delivers packages to people around the galaxy on a floating Japanese house. Sono's wife, actress Megumi Kagurazaka, stars as Yoko, the robot deliverywoman who starts to wonder what it means to be human. I like the desaturated look and simple designs of the sets. I'm curious. A spaceship shaped like a Japanese bungalow careens through the galaxy. It carries a humanoid robot named Yoko (Megumi Kagurazaka), a sort of interstellar UPS delivery person. Her job is simple: to distribute packages to human beings scattered across sundry planets. But with so much spare time between deliveries, Yoko begins to wonder what's in those packages. 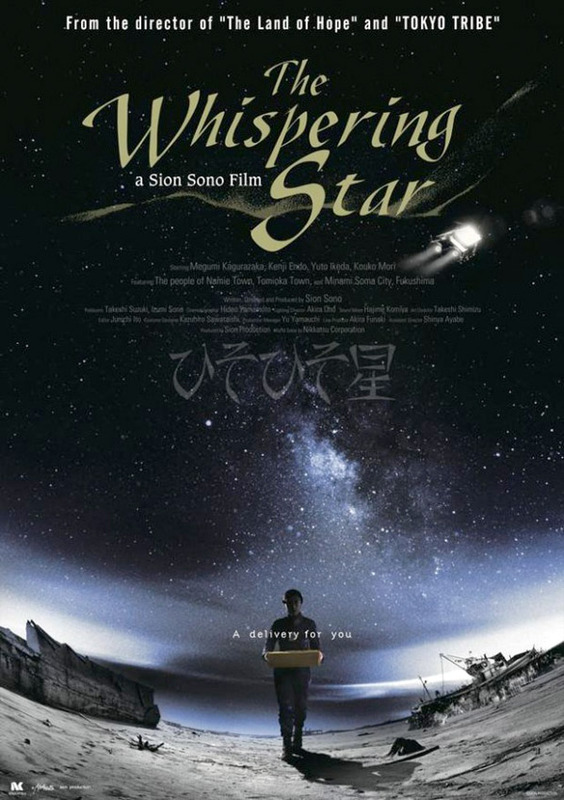 The Whispering Star is both written & directed by acclaimed Japanese filmmaker Sion Sono, of many films previously including Love Exposure, Cold Fish, Why Don't You Play in Hell?, Tokyo Tribe and Shinjuku Swan most recently. This first premiered at TIFF 2015, and also played the Rome Film Festival and Tokyo FILMeX. No US release has been set yet. Wow Sion Sono is really picking up the pace with his releases these days. Sucker for things like this. Too much good stuff. This looks unique as all heck.